"Seitenscheibendichtung, Vorderkannte der Scheibe, A-/B-Body"
Pro Auto werden zwei benötigt. 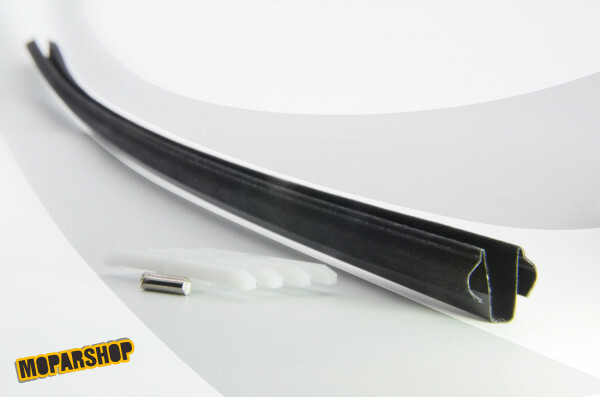 Glass channel weatherstripping for 1966-1970 B-body models. U-shaped channel that fits front edge of door glass and also fits front edge of pop-out quarter glass on 2-door sedans. Fits in 1967-1974 A-body models except Duster, Demon and Dart Sport too. U-shaped channel that fits on the front of the door glass, allowing it to seal to the front of the window frame. Includes mounting clips. Use 2 per car. New Chrysler.